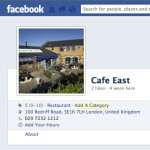 Did you know Cafe East has a Facebook page? Maybe you’d like to post a message or some photos of a recent meal you’ve had at Cafe East? We’d love to hear from you. Stay in touch with all our latest news and read what others have to say about us. Comment on your favourite dishes and let us know where we’re going wrong! Click the “Like” button below to stay in the loop. Thanks! « Cafe East now Tweeting!